Mako sharks are extremely tough to land once they’ve been hooked, but the captains at MGFC know a thing or two about landing these great fish. Of the pelagic species common to the Gulf of Mexico, MGFC fishes for Mako sharks and Tiger sharks. Wanna catch one of these bad boys? Let’s get ready to rumble. Both species are definitely a nice, big game target for sport fisherman. Their size, speed, agility and “bad” attitudes are truly a memorable display. With the Makos, there isn’t another shark that has such a massive set of teeth like this beast has. Beyond appearance, Makos are known as the “don’t Mess with Me” attitude holders of the sea. When fishing for Makos, know that these sharks are extremely fast — one of the fastest fish in the ocean — and have a stamina rarely seen in other types of sharks. Shark fishing for Mako is primarily for sport, but,their steaks taste great, too. Mako sharks are true, world class, predators. There actually are two sub species of Mako: the Longfin Mako and the Shortfin Mako. Longfins are more sparse and rare species, who favor warm waters. Shortfins, also called Bonito Shark or Blue Pointers, Shortfin Makos are what we see in the Gulf off the Coast of Louisiana. Makos are heavy-bodied sharks with a huge mouthful of bulging teeth that are long and pointed. They’re blue above, and white below. Most Makos weigh between 200 – 600 pounds, but some are known to exceed 1,000. In fact, Capt. Kevin Beach, of the Pale Horse, landed a 765 pound Mako that held the Louisiana State record for many years. 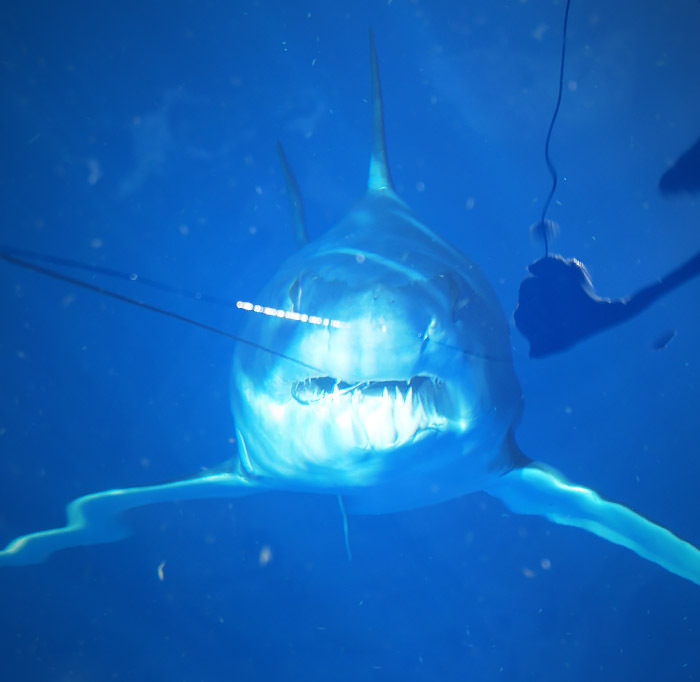 At MGFC we use a variety of fishing techniques for sharks that include: ocean trolling tackle, in at least 50 class outfits with wind-on steel leaders, with 50-lb and 80-lb leaders being preferable. Sharks usually strike rigged baits, such as mullet and Mackerel, but a live Bonito or similar bait fish is even better. In addition to fishing for Mako sharks, we also encounter Tiger sharks — another pelagic species. Tiger sharks are large, beautiful creatures, with alternating areas of dark and light brown color. When young, the darker markings on Tiger Sharks appear as spots, and sometimes are called :Leopard” sharks. Mature Tiger Sharks feature the easily recognizable pattern of stripes. They swim in the open sea, though sometimes are found in shallower waters. These creatures are known to exceed 1,000 pounds. Book a shark trip with MGFC! They’ll eat just about anything we throw at them, but good baits include stingray wings and live or dead fish species — appropriate, of course, to the size of the fish we’re seeking.